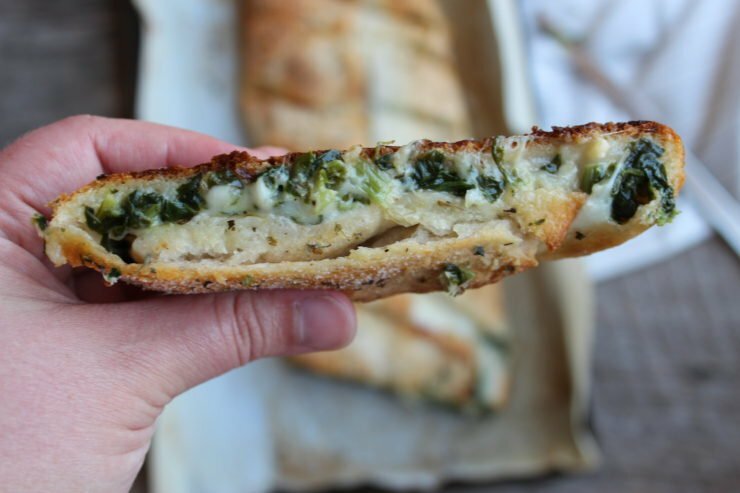 Let’s talk about this Easy Spinach and Cheese Calzone, shall we? 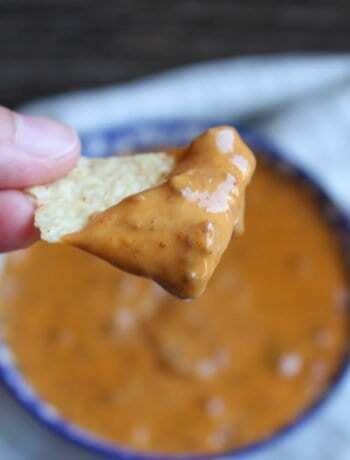 I think most of us probably love bread and ooey gooey melted cheese (I mean, who doesn’t?!) 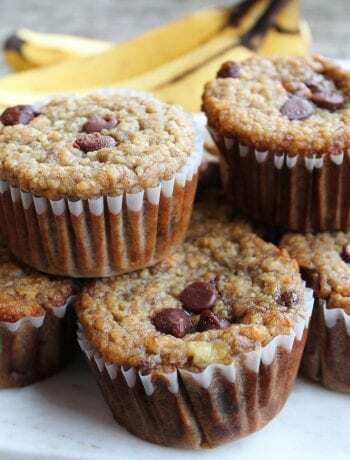 and while I will admit, this isn’t quite as healthy as some of the recipes I’ve been creating here lately, I feel like there should always be room for occasional indulgences. 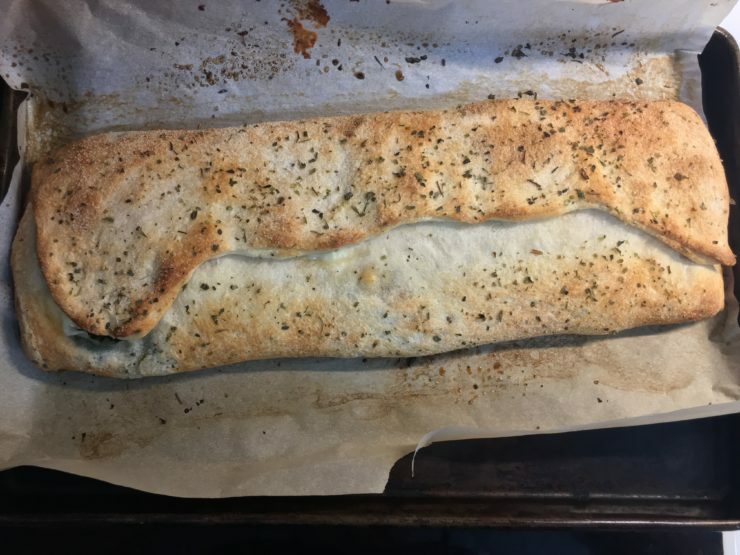 This recipe came about when I was desperate for a good calzone and there was just none to be had in the tiny Central Arkansas town I live in. Well, desperate times call for desperate measures so I ran down to my local grocery store and grabbed a few ingredients that sounded like they would be good together and then got to work in my kitchen. 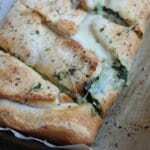 A few tweaks here and a little twist there and lo and behold this recipe for Easy Spinach and Cheese Calzone was born. 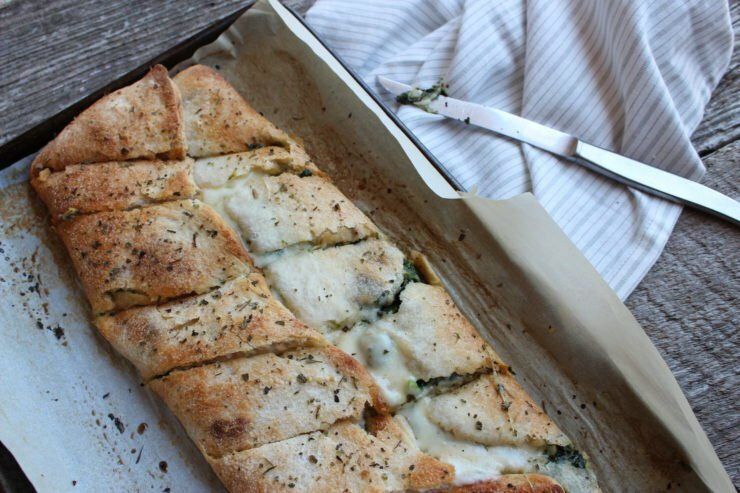 This is also a great way to get picky eaters to love spinach – season it up really good with my secret ingredients and they will be begging you for another slice of this Spinach Calzone! As always, let’s go start out by preheating our oven to 350F. Preheating your oven is so important if you want your cook time to be fast and efficient. Once your oven is preheating, grab your sheet pan and cut a square of parchment paper out to fit your pan. 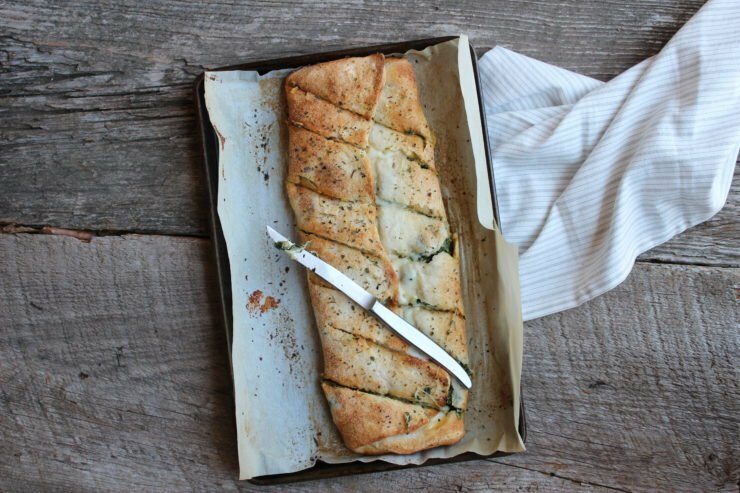 Using parchment paper ensures that your Calzone won’t stick to the pan and also makes for a fast and effortless clean up – just throw the paper away and your pan will be clean and ready to go again! Now that our pan is prepped and ready and the oven is preheating, do that thing you’ve been dreading and pop that can of pizza dough open. Spread the pizza dough out into the pan and use your hands and fingers to work the dough all the way to the edges of the pan so that the dough is even and smooth. If holes or tears occur while your spreading, just pinch and spread them closed again. Once your dough is spread out evenly, spoon 3 tablespoons of Alfredo Sauce (I use store bought to save time but if you have homemade sauce that would be even better!) into the center of your pizza dough. 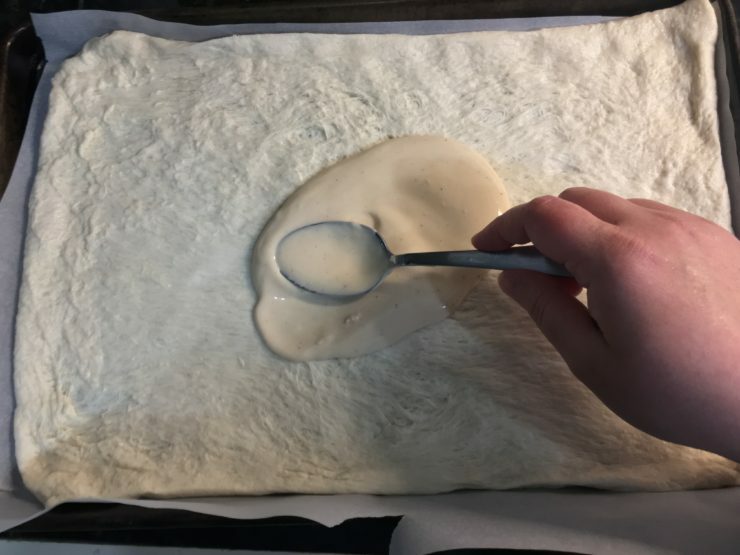 Using your spoon, spread the Alfredo Sauce out evenly over the pizza dough until the entire surface of the dough is covered in creamy, delicious, Alfredo Sauce. 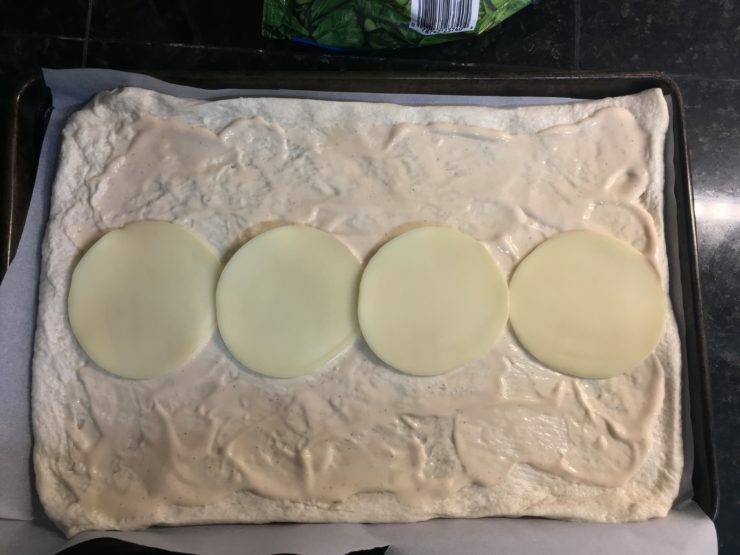 Grab 4 slices of non-smoked Provolone Cheese and place them down the center of the pizza dough from left to right. Now place 1 cup of the frozen, chopped spinach down the center of the cheese. 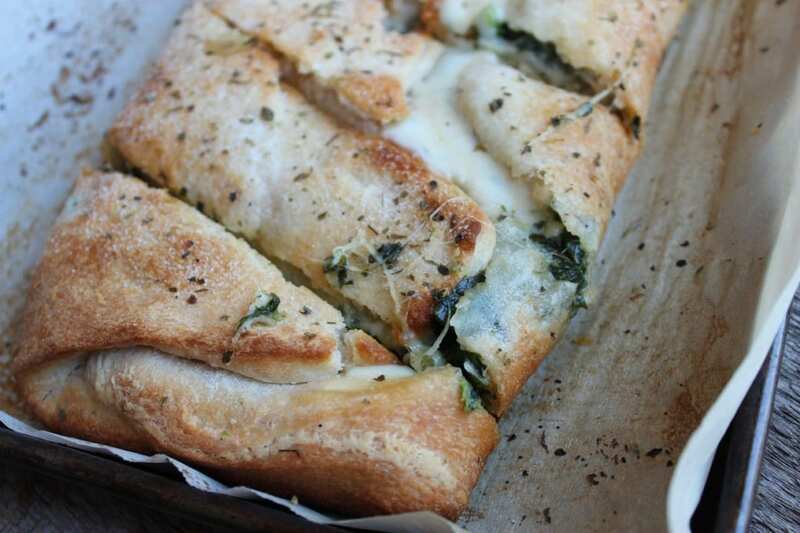 You DO NOT have to thaw the spinach out before placing it on your calzone! 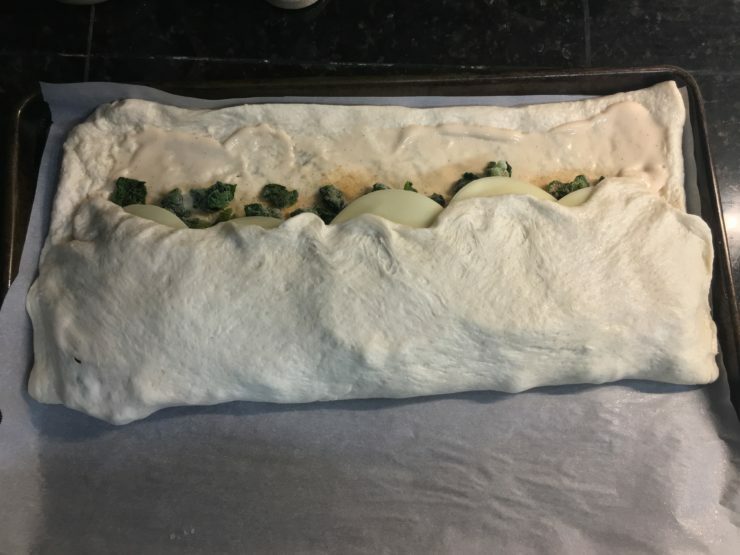 It will thaw and cook when you bake the calzone so thawing the spinach out beforehand isn’t necessary and will just add one more time consuming step if you choose to do so. After your spinach is in place, sprinkle it moderately with Garlic Powder. I don’t measure this, just eyeball it and sprinkle evenly. 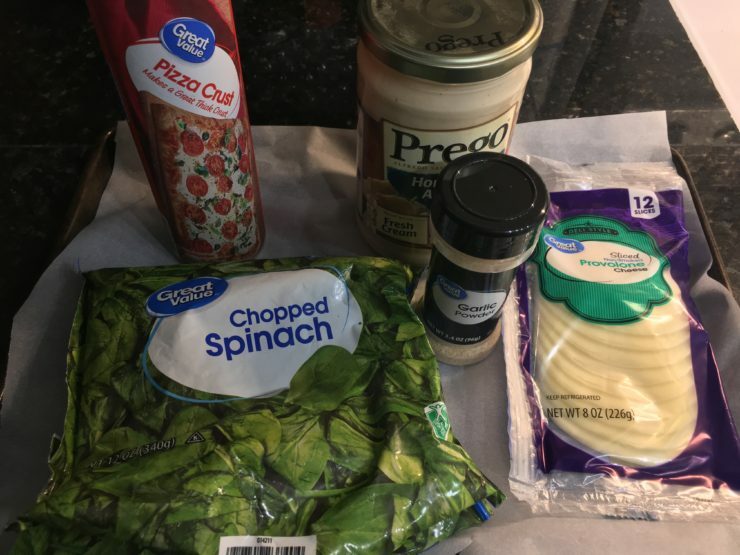 Everything is always better with more cheese so let’s just go ahead and add the remaining 5 slices of non-smoked Provolone to the top of our spinach. 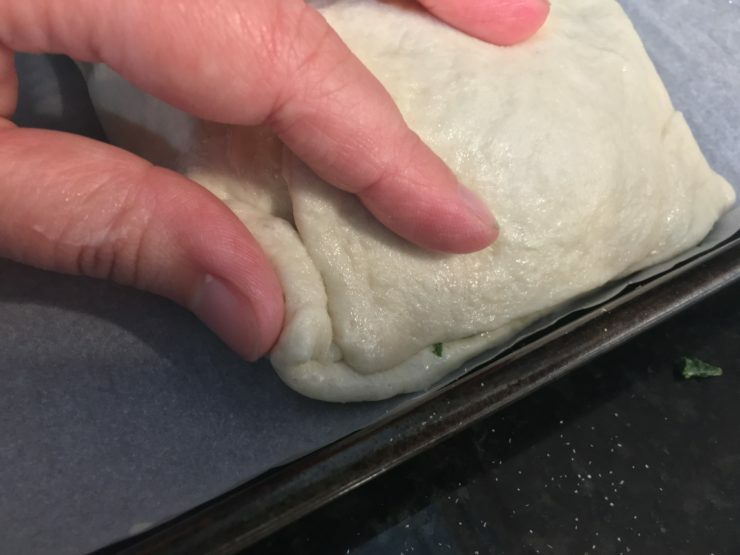 Now that all of your ingredients for this fabulous Easy Spinach and Cheese Calzone is now in the calzone, take the edge of the dough that’s closest to you and fold it over to the center of the calzone, covering the ingredients that are in the center. 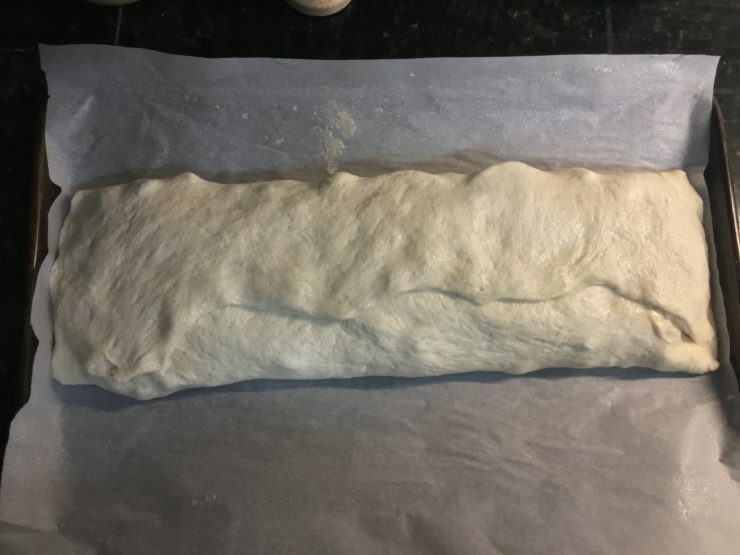 Now grab the other side of the dough that hasn’t been folded yet and fold it in to meet the other half of the dough, overlapping it in the center so that the seam is closed and the ingredients in the calzone are completely sealed inside. 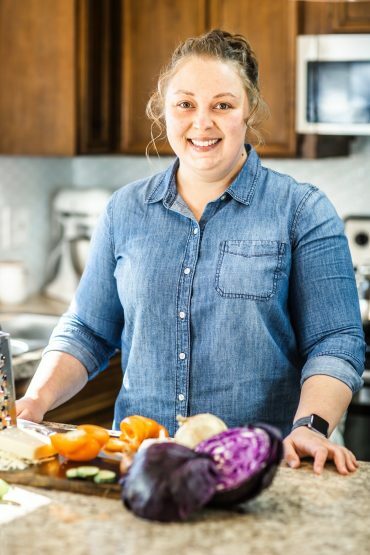 Your last step to tucking away these ingredients and ensuring that none come out when baked is to pinch the ends of the dough closed with your finger tips. 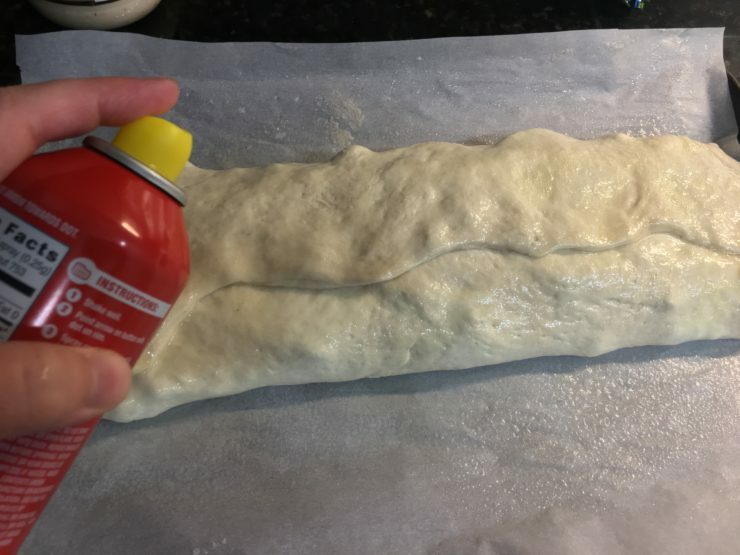 Use some nonstick cooking spray (Canola Oil or Olive Oil Spray is a good choice) and spray the top and sides of the calzone generously with the cooking spray. If you want to add a little more flavor (and calories) brush the top of the calzone with melted butter. 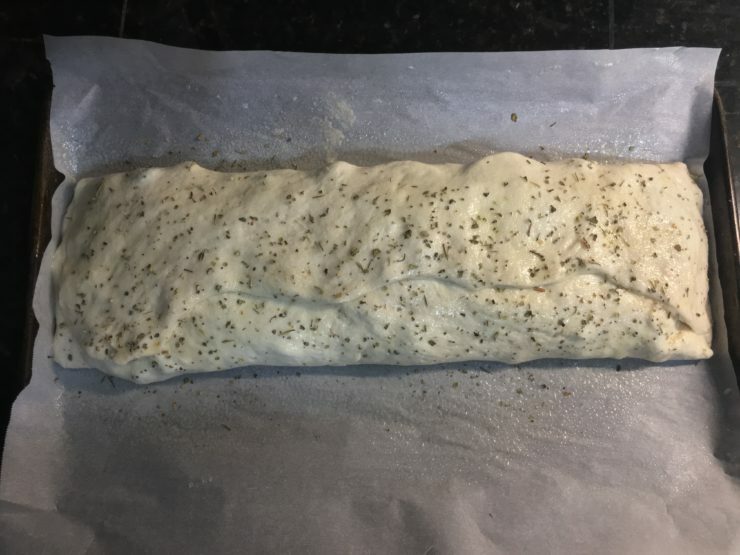 Once the top of the calzone is sufficiently greased, sprinkle it lightly and evenly with garlic salt and Italian Seasoning. 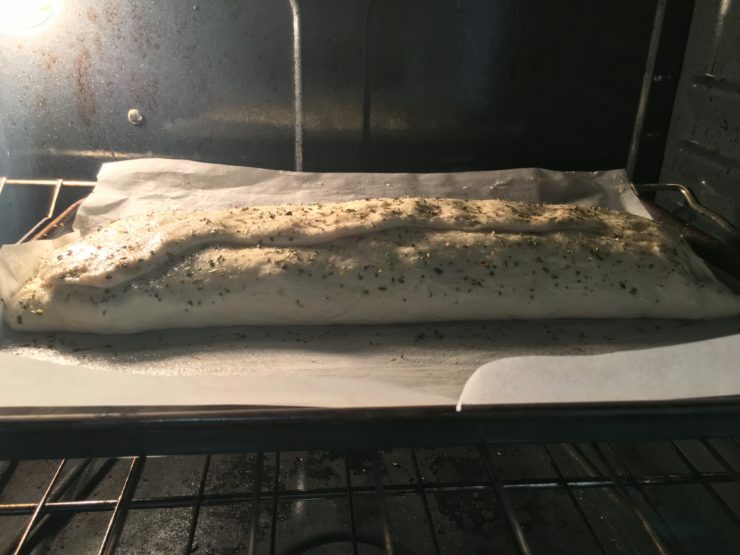 Place the Calzone in your preheated oven and bake at 350F for the first 10 minutes, then reduce the heat to 325F for the remaining 10 minutes. 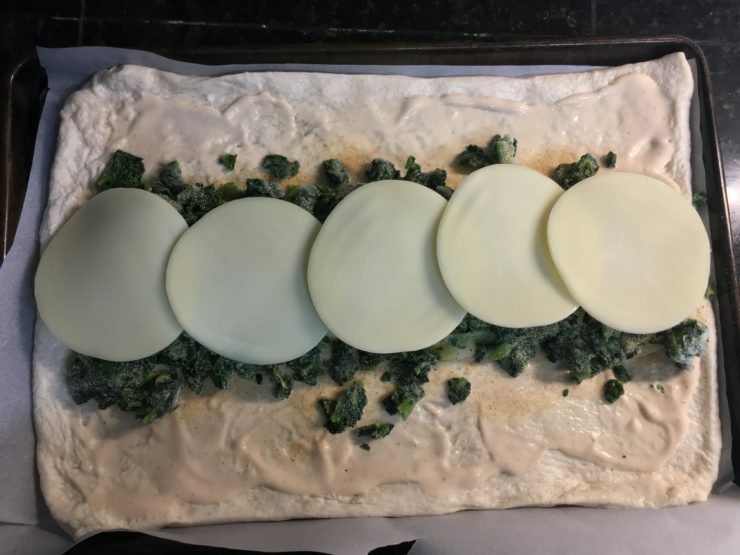 Once the Spinach and Cheese Calzone is cooked through, carefully remove it from the oven and slice it on the diagonal into eight pieces. 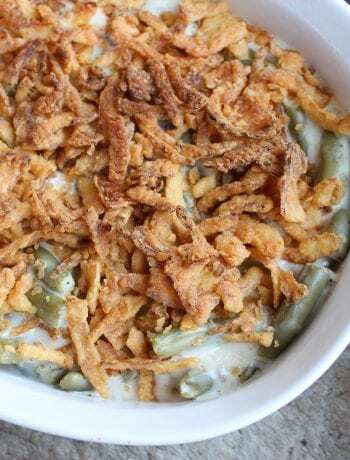 This messy, cheesy, incredibly delicious goodness is now ready to serve! 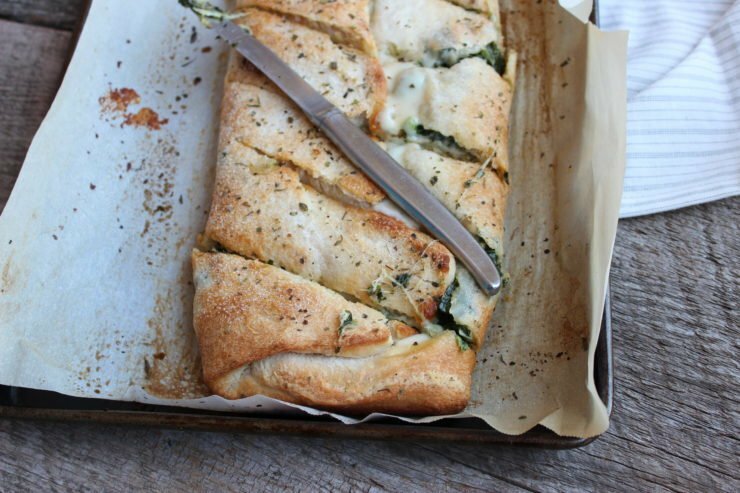 I like to serve our Easy Spinach and Cheese Calzone with a small vegetable tray (just any fresh, raw veggies you like with some veggie dip) or with a nice salad. If you want to serve your Calzone with a salad, this Easy Caprese Salad is a great choice and is also fast and easy to whip up in no time! As always, thank you for stopping by my kitchen and I hope you have a wonderful, fun-filled week! A fast and easy savory Italian dish that the entire family will love. 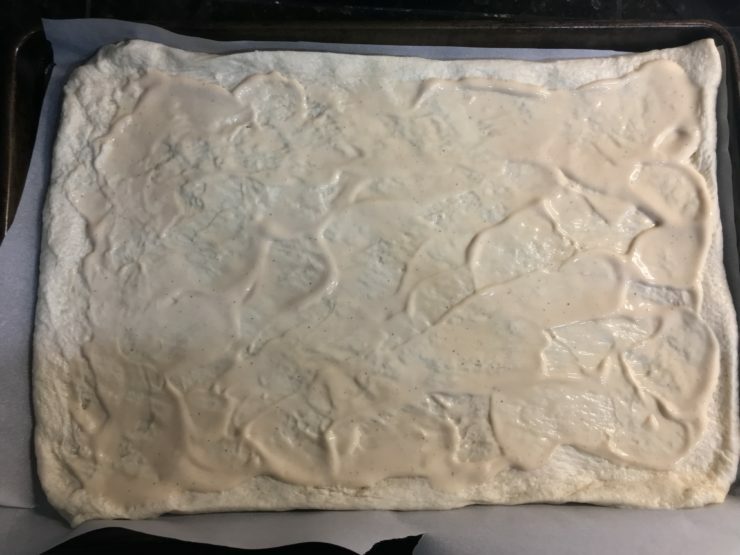 Roll the pizza dough out onto the parchment paper and use your hands to spread the dough out evenly to the edges of the baking sheet. Make sure no tears or holes form in your dough. Spread the Alfredo Sauce out evenly over the pizza dough. Start by placing four slices of cheese down the center of the dough from left to right. Add the spinach on top of the cheese and season with garlic powder. Top the spinach with 5 more slices of the cheese. Start folding the calzone by taking the half closest to you and folding that dough up over the top of the mixture in the middle. Now take the other side of the dough and fold it over the dough that you already have folded over in the middle. 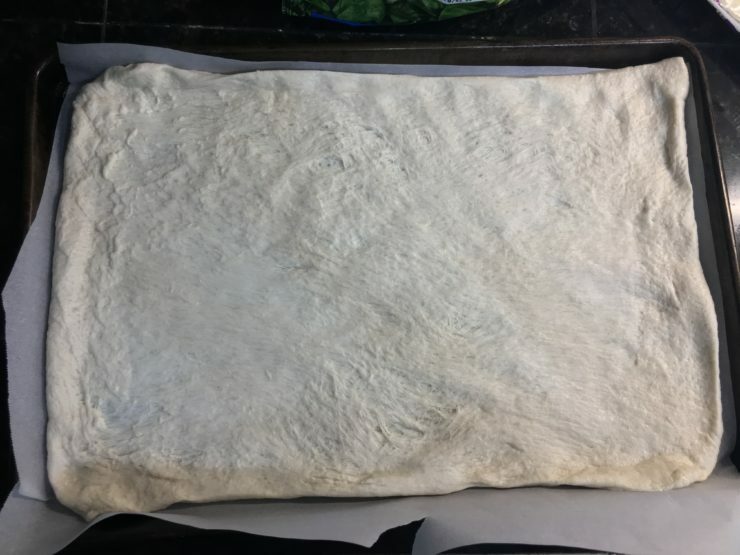 Finish the dough by pinching both ends closed so that the ingredients are completely enclosed in the middle of the dough and the dough is sealed all the way around. Spray the top of the dough with nonstick cooking spray, then season lightly with garlic salt and Italian seasoning. Place the calzone in the oven and bake at 350F for the first 10 minutes, then lower the temperature to 325F to finish cooking for the remaining 10 minutes. Slice the calzone on the diagonal once it is cooked and removed from the oven. Enjoy! 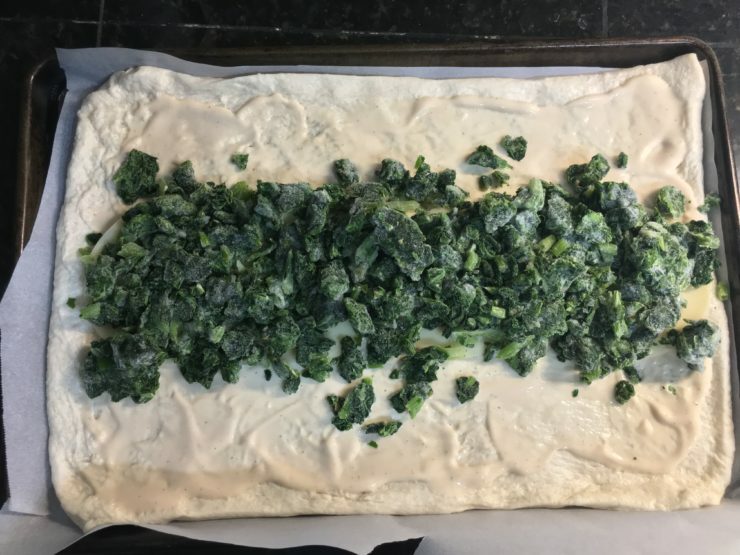 There is no need to thaw out the frozen, chopped spinach before adding it to the Calzone. 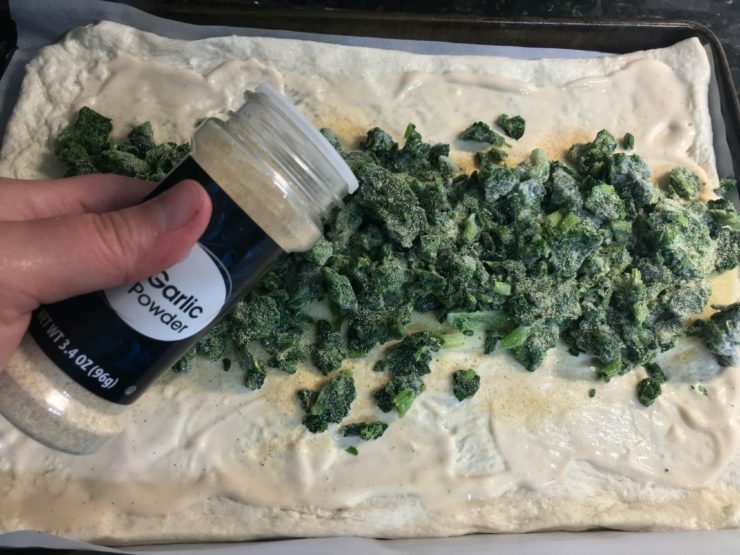 The spinach will cook perfectly fine in the calzone if you add it in frozen, so save yourself a step! Thanks so much Julie! I hope you love it as much as we do! I made this for my husband and me tonight. We both loved it! I made it exactly as your recipe except I did add some pepperoni. Made a salad and we both really enjoyed our meal! I’m so glad you all loved it! Thank you so much for coming back to tell me – that just made my day!